Kitchen appliances that can serve multiple purposes are great buys because they can save you money and counter and storage space. After all, you don’t have to do without some nice tool when it comes bundled with a must have one! Indoor grills are quite popular with apartment dwellers and home owners living in temperate regions because they can grill their favorite foods all year round and they don’t need a suitable outdoor space for it. Griddles are great for family breakfasts. Since both appliances are very similar, it makes sense to combine their functions into one unit, right? Well, one such piece of equipment is the Cuisinart GC-15 Griddler Compact Grill Centro. Compact yet versatile, the Cuisinart GC-15 Griddler presents a grill that can do almost anything. With a base tier that automatically turns kebabs and hot dogs evenly, and a top tier that effortlessly converts from grill to griddle and back, the Cuisinart GC-15 Griddler is the perfect barbeque and/or breakfast companion. If you’d rather stick to separate appliances for these tasks, we have reviewed gadgets in the skillet and griddle categories as well as the grills that are perfect for meats and veggies. But let’s take a closer look at the 2-in-1 GC-15. Designed with precision and constructed with solid stainless steel, the Cuisinart Compact Grill Centro looks sleek and modern in the kitchen and blends well with most kitchen décor. The stainless steel insulation also ensures improved safety and compliance with food and safety regulations. Measuring 15.7 by 10.1 by 5.6 inches, and weighing 12.8 lbs, the Cuisinart GC-15 Griddler is indisputably compact and can be carried outdoors for barbequing and safely operated on the buffet table during chitchats. Being in the range of the most portable grilling equipments, the Cuisinart GC-15 Griddler is one of the most impressive in the market today. The device, which comes with a flip-style non-stick die cast cooking plate on top, can serve both as a griller and as a griddle. The ridged grill side of the plate is good for cooking vegetables and meats, including steaks, while the griddle side can be used for cooking eggs, bacon, pancakes and many other breakfast items. If that is not enough, the equipment also comes with a detachable kebab drawer where you can cook kebabs, hotdogs, sausage rolls, and other skewered dishes. A mechanism that is referred to as two tiered cooking. 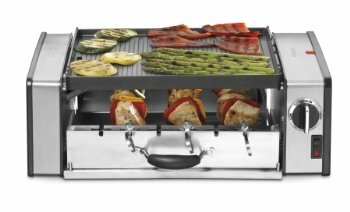 With the two-tiered cooking mechanism, the Cuisinart GC-15 Griddler makes it easy to cook kebabs and sausages at the bottom and grill your favorites on the upper side. The six-piece stainless steel skewer set allows you to grill as many as six kebabs at once in the bottom tier, while the six rollers allow you to place 5 sausages at once between them. You can use either the skewers separately or the rollers with skewers inside. The ends of the skewers rest on grooves in the kebab drawer in the front and at the back and they rotate slowly when the unit is on. Of course, you can also cook your sausages on the grill top if you prefer not to bother with the bottom tier, but you would need to turn them manually to ensure even cooking. The device also comes with other additional features, including adjustable temperature controls (low, medium and high), power on indicator light, skid resistant feet, overheat protection, and a power output of 1000 watts. The adjustable temperature controls ensures that the food cooks evenly and perfectly. The skid resistant feel ensures that the Cuisinart GC-15 Griddler stays put during operation. The grill plates snap in and out with ease and draw off grease to an incorporated but removable drip cup that’s set into one side for healthier cooking. Just make sure that the grill slot lines up to open within the drip cup. Consecutively, its convenient handling and helpful cleaning features allow you to remove any leftover foods from the cooking plate. To clean it up, turn off the selector dial control and unplug the device from the power outlet. Allow the device to cool off for thirty minutes and then use the scraping tool to remove any leftover food. To remove the plates from the housing, press the plate release buttons. The cooking plates, skewers and rollers, drip cup, kebab drawer and scrapping tools can be cleaned in a dishwasher or by hand. For the control knobs, cover and housing base, use a damp cloth to clean. For storage, each skewer inserts into a roller. The Cuisinart GC-15 Griddler is elegantly built to aesthetically blend with your kitchens interior décor. The equipment is also easy to clean. Its parts and accessories are also dishwasher safe. You can get a lot of use out of this one appliance so it provides great value. Easy to use and comes with adjustable temperature controls to ensure perfection in your grilling. Its compactness and portability make it safe to use for both indoor and outdoor grilling. The heating element works perfectly both on the cook top and on the rotisseries. It’s designed in such a way that allows you to flip the pan preventing overuse of one side. You have to practice how to use the skewers perfectly and you can’t make very thick kebabs in order to use all 6 skewers. The electric cord is considerably short so you might need to use an extension cord. When skewering meat, you have to do it in one neat shot without repositioning, as the skewers are thin and can result in them rotating while the meat stays stationary. The 1000 watt power can make the unit really hot and should be handled carefully. ← What is the Best Juicer Under $200 in 2016?